Making this dish last night the kids asked what's for dinner. I replied "Pork chaaaps and apple shaaauuusssse". They looked at me like I had finally gone over the edge (they've been expecting it for years) as I laughed and told them that they just didn't get it. Close your eyes and say it... Pork chaaaps and apple shaaauce. If you are a girl in my age range the phrase will take you back about 35 years. Preheat oven to 400º. Season pork lightly with salt and pepper. Heat 1 Tbs oil in a large ovenproof skillet over medium high heat. Add the pork and sear until all sides are browned. Remove pork to a plate and cool slightly. While pork is cooling, add remaining 1 Tbs oil to the skillet and add the apple and onion pieces, sprinkle with cinnamon. Sauté over medium heat until slightly tender, 4-5 minutes. While the apples and onions are cooking spread the mustard over the top of the pork. Sprinkle with the herbs, adjusting to your taste. When the apples and onions are tender, remove the skillet from the heat and return the pork to the pan, placing over apples. Place the skillet in the oven and roast until the apples and onions are very soft and the pork registers abotu 140º on a meat thermometer (slightly pink after resting), about 20 minutes. Remove the pork to a cutting board and rest for 5-10 minutes. Return the skillet to the stove and pour the apple juice and broth over the apples and onion mixture. Stir over medium high heat until slightly reduced, remove from heat. Cut pork. Spoon the apples and onions onto a plate and top with the pork. Enjoy! This looks awesome! My friend makes something similar to this with applesauce. Love this!!! My daughter is a big pork and apple fan for sure!!! Too late for me to be reading such a tasty recipe. Obviously I am a girl in your age range because I knew it before I even clicked on the link. I love pork and apples together, although I am quite partial to the totally-bad-for-you crackling. I will have to pick up a pork loin this week so I can try it. Love the pork tenderloin roast, with the apples and onions, and the wonderful spices you used. Loved Alice too, wonder if she's still alive? HAHA! That's hilarious! I'll have to show my girl, she's going to love it. I totally remember the Brady Bunch and how we used to watch it as much as we could. I think we found the glow of the tv warm and soothing. I don't fix pork often because I'm not a huge fan unless it has a lot of flavoring or something like your recipe. To me, it's not as good plain like a good steak or chicken. Didn't have to watch the video for that one! 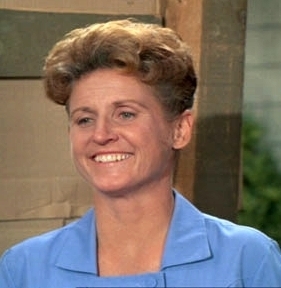 I loved the Brady's growing up...and Alice too. She was so cool. Girl, you rocked it out with this one! Sounds so good. I wish I could get the hubs to eat pork tenderloin. He just doesn't like it. Maybe I'll try this recipe on him. This is the best winter meal I've seen in a while. I'm hungry for second dinner now. Ode to Alice! This post is super cute. 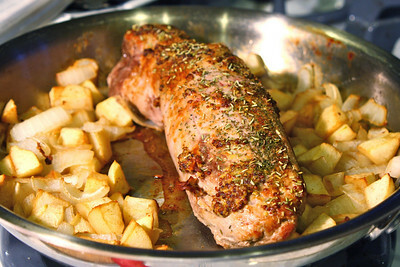 I have never attempted a pork tenderloin, but you make me want to bust it out this weekend with the apples! Gorgeous photograph! Oh the good old Brady Bunch. That's dates the likes of us, doesn't it? But this meal is timeless. Timeless, I say! Your tenderloin looks great! I say that saying all the time when I am making chops - and you know what I had no idea why...or where it was from...ha!! Thanks for the reminder and blast from the past! Alice was the best! Great post, and I love this recipe!